#Broken or #NotBroken | Chip'n'Dale Runner: Go Nuts! WARNING – graphic/painful photo below. You’ve been warned! 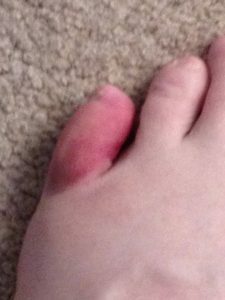 I can’t seem to catch a break, first illness creeps in to curtail my training, and now I manage to bust up my toe trying to navigate my daughter’s Home Alone-style bedroom. Stepping on little plastic things is not good, but especially for any type of running. Now my little toe is all sorts of colors, and the big question #Broken or #NotBroken? Can’t really put much pressure on it, but if it is broken doctors probably won’t do much more than tape it anyway. So back to the drawing board I go waiting for this thing to heal. Luckily, I got some quality runs in this past week. So, you be the judge, #Broken or #NotBroken? Either way, it’s #NoRunning for me!